Job seekers are asked to register their particulars with us. Our consultants will match your background and experience with the current vacant positions given by our clients. If the match is there, the process of your job seeking will be fast. What is the process like registering with Orange Recruit? Register at our website or submit your CV/Resume by fax or email. 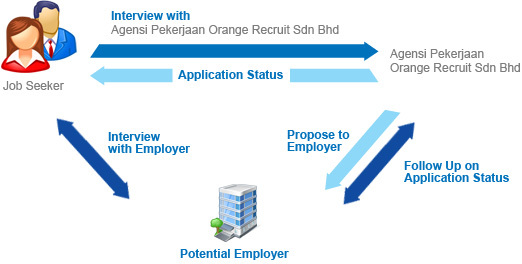 Orange Recruit consultants will conduct the interview at orange recruit office or at open registration sessions. Orange Recruit will introduce positions that match your profile. With your consent, Orange Recruit will send your CV/resume to our clients. Orange Recruit will arrange the interview with the client and follow up with the application process.